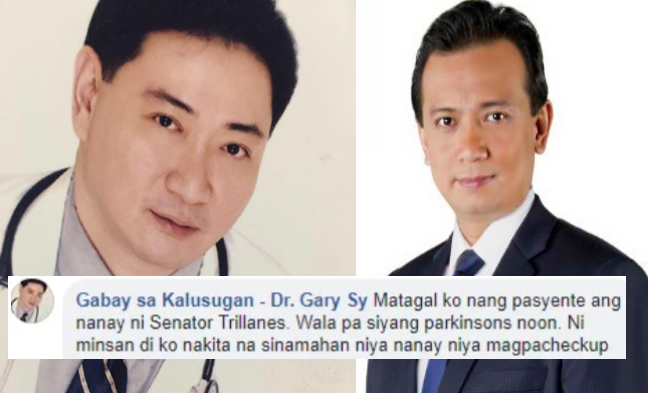 Dr. Gary S. Sy, a medical practitioner specializing in Geriatric Medicine and social media personality, revealed something about the Philippine President’s staunch critic, Senator Antonio Trillanes IV, about his relationship with his mother who is suffering from Parkinson’s disease. Antonio’s mother, Mrs. Estrelita Trillanes, has been Dr. Sy’s patient long before she was diagnosed with Parkinson’s disease. “Matagal ko nang pasyente ang nanay ni Senator Trillanes. Wala pa siyang parkinsons noon. 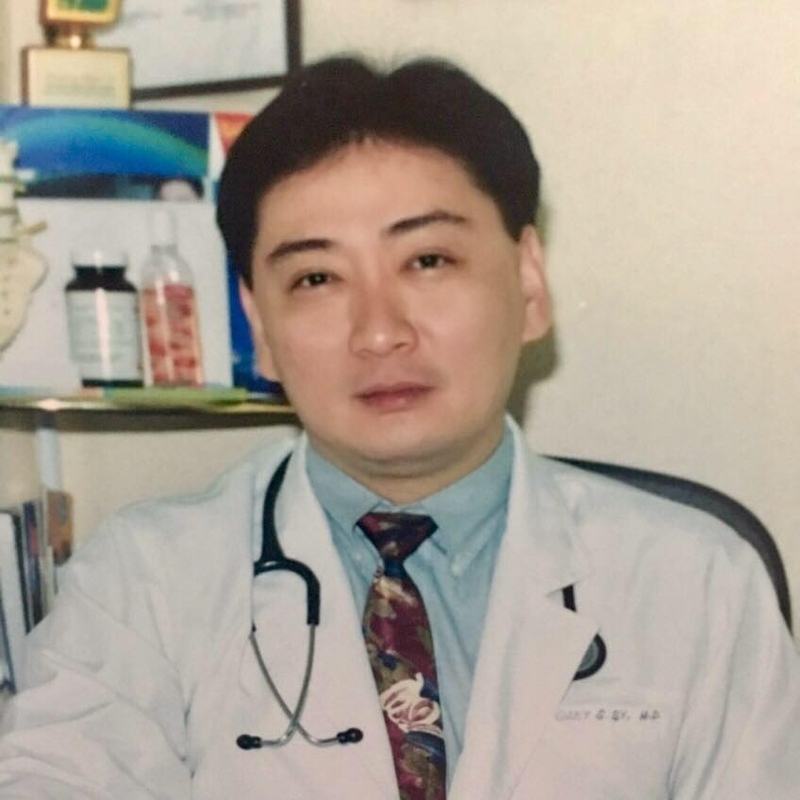 Ni minsan di ko nakita na sinamahan niya nanay niya magpacheckup sa akin.” Dr. Sy said. According to the doctor, Estrelita always whine to him about her son’s lack of time, specially during the times she needed him the most. 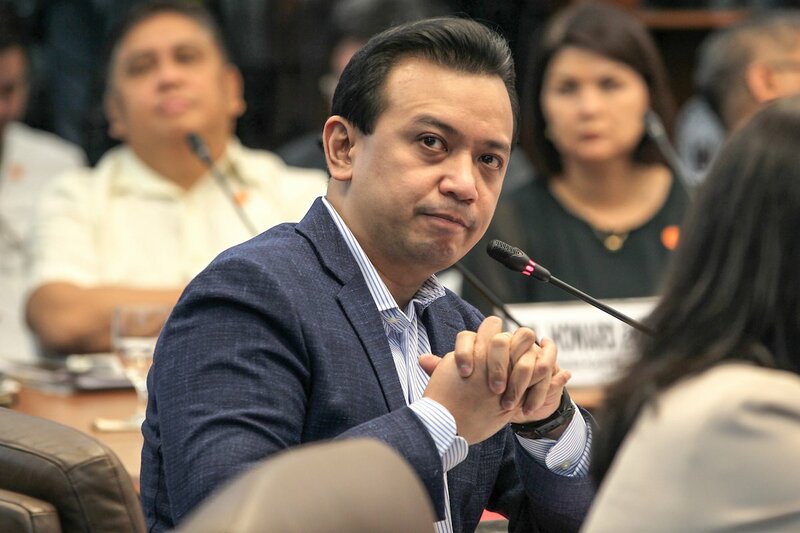 Mrs. Trillanes said that her son is always busy in politics, which stresses her whenever she sees her son on the Television. Dr. Gary always saw Mrs. Trillanes being accompanied by their driver or a friend, but never the Senator, to his clinic for a medical checkup. “Dumain pa nga si Nanay na panay politics inaatupag ng anak at di man sya masamahan magpatingin o kmustahin man lang. Dagdag pa niya nastrestress daw siya panoodin sa tv anak niya.” Dr. Sy said. Dr. Gary always believes that a person’s character is a reflection of how he treats his parents. “Naniniwala ako na kung paano itrato ng anak ang magulang reflection yun ng pag-uugali ng isang tao. Yan po paniwala ko.” Dr. Sy added. Parkinson's disease (PD) is a progressive nervous system disorder that affects movement. Symptoms start gradually, sometimes starting with a barely noticeable tremor in just one hand. Tremors are common, but the disorder also commonly causes stiffness or slowing of movement. To answer the comment of a dissapointed netizen on his post, pointing out Sy’s violation of doctor-patient confidentiality, Dr. Sy said that Trillanes had already announced his mother’s condition to the public Meanwhile, some netizens reacted on the post of Sy and warned him about the possible consequences of revealing Mrs. Trillanes relationship with her son. “Regina Cebreros Sonio madam are you serious? Basahin mo maigi. Anong medical info i revealed na di niyo pa alam? You are disappointed? Why? I know what is doctor-patient confidentiality. Doctor should never discuss the medical problems of their patients. Yung parkinson’s disease ni Mrs Trillanes di ba yung anak niya nagsabi sa media? So what are you talking about?” Sy commented. Loy Macalino: Naku doki c trillanes ang best exsample ng politikong mangmang..sagana sa salita wala nman gawa puro ngawa..nakakapagod na talaga cla..never q nman binoto mga bwiset na yan. Helen Enriquez: Korek ka dyan doc. Paano mo paniniwalaan ang sinseridad ng pinapakita at sinasabi nya sa taong bayan kung ang sariling ina di nya mabigyan ng tamang pagmamahal at atensyon. Nakakaawa lng ang kanyang ina at sya ang naging anak.